Please refer to our stock # 2015 when inquiring. 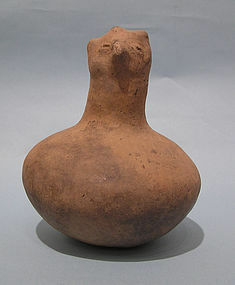 Native American Terracotta Hooded Owl Effigy Vessel, Mississippian Period, 1200 - 1300 C.E., found on Tyler Mound, Fulton County Kentucky in 1930. Spherical body with protruding beak and well defined eyes. Small void on reverse for filling vessel with liquids. Vessel is repaired from original pieces, otherwise in very good condition. 8 1/4" high. Ex: Archaeologist Bart Reid, Charlottesville, VA. The history of ancient dwellers of Fulton Co. Kentucky now appears only in their silent monuments, as silent as the race, the fact of whose existence they perpetuate. The relics they left are the only key that we possess of their lives, and these give a history whose antiquity seems almost Adamic. The principal remains left consist of earthworks, mounds and parapets, filled with the rude implements of the people who built them, and with the bones of these lost portions of humanity. From their proclivities to build these earthworks, these people are known as " Mound Builders," the only name that now fits their peculiar style of life. The mounds erected by them are of all sizes and shapes, and range in height from three or four feet to sixty or seventy feet. In outline, they are of equal magnitude, though none of great height were ever known to exist within the confines of Fulton county.